Any decision in life, whether ordering take-out or taking over a corporation, should be left to the randomness of the universe. Like flipping a coin, or even better, a 1935 thought experiment on quantum mechanics by an Austrian physicist. Explaining the science behind the Schrödinger's Cat experiment would require several thick tomes, so here's a gross summation of the idea behind it. 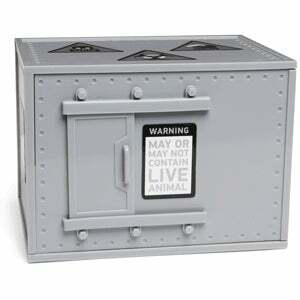 You stick a cat in a box with a bottle of poison that will be released if a radioactive element releases a subatomic particle. But since there's no way to observe what's going on in the box, and some particles are believed to only exist when actually observed, there's the possibility that the cat can be both alive and dead at the same time. Confusing, I know, but the idea works well for a novelty desk toy. As long as you can't see the cat, it can exist in the bizarre dual states of life and death. But when you slide open the door and take a look, it randomly snaps into one of the two states. And in this case, a living cat means yes, while a dead feline obviously means no.